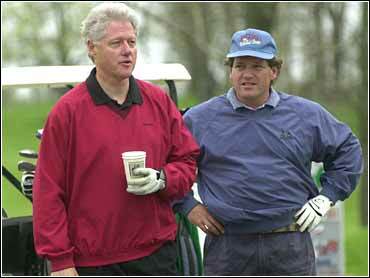 The investigation into Roger Clinton's role in seeking presidential pardons has deepened, with reports that people were solicited to pay large sums of money in return for his help in their pardon cases. In one case, investigators are trying to determine whether two Arkansas businessmen used the name of the former president's half brother to swindle people out of money by promising pardons and business deals, The New York Times and Los Angeles Times reported Saturday. Roger Clinton told The New York Times through a spokeswoman Friday that though he knew the two men, he had never authorized either one to use his name. In another case, the Los Angeles Times reported that a lawyer talked his client out of paying Roger Clinton $15,000 to secure a pardon. Gene O'Daniel said Phillip David Young, an Arkansas restaurant owner who was convicted of illegally transporting game fish across state lines, was ready to pay the money before he intervened. "I told him it was crazy," O'Daniel told the newspaper. "I had to talk him out of it." His client ultimately received a pardon without paying Clinton, O'Daniel said. His intervention has prompted federal investigators to look at whether Bill Clinton's brother sought payments for pitching pardon requests to the former president, the paper reported. O'Daniel also said Young turned down an initial proposal calling for him to pay Roger Clinton $30,000 to help his presidential pardon request. In the case involving the alleged use of Roger Clinton's name, a Texas man, Guy H. Lincecum, said he and his mother paid more than $200,000 to the businessmen for a pardon for his brother but never received one. The checks were deposited in the account of a company called C.L.M, which Lincecum was told stood for Clinton and the last names of the businessmen, George Locke and Dickey Morton, The New York Times reported. Roger Clinton and Hillary Rodham Clinton's two brothers have been embroiled in controversy over their efforts to obtain pardons for friends and clients from former President Clinton. Bill Clinton issued a total of 140 pardons and 36 commutations in his final hours in office.